Welcome to the new BOTB Supercharged Club – our way of saying thank you to loyal and valued BOTB customers. There are 3 tiers: Gold, Silver and Bronze. Supercharged Club members can track their tier progress and benefits on the My Supercharged Status page once logged in. Spend £10 in a 4 week period to qualify for Bronze. Spend £20 in a 4 week period to qualify for Silver. Spend £40 in a 4 week period to qualify for Gold. How do I become a Supercharged member? By playing all competitions on a regular basis, you'll quickly qualify as a Supercharged Club member! For specific qualifying criteria of each of the Supercharged tiers see above. You can track your progress to each of the tiers by clicking on the My Supercharged Status link in your account section. When do I move between tiers? Qualification for tiers is based on a rolling 4-week Dream Car Competition cycle. Your Supercharged tier is calculated on a weekly basis after the competition has ended each Sunday night by considering your spend for all competitions in the previous 4 weeks. Please note, it may take until 6am on a Monday morning for your tier status to be reflected in your account. You can see the competitions that contribute to your Supercharged tier status on the My Supercharged Status page. Any spend in the current competition will count towards your Supercharged tier in the next competition. How do I claim my free tickets? Free Dream Car Competition tickets for Supercharged members will automatically be added to your basket at the start of any qualifying competition. Simply log in to your account, select your free ticket from your basket and choose the car you would like to play for. Gold and Silver tickets will be awarded each week, and Bronze tickets every other week. Please log in and check your account as free tickets are only valid until the end of the competition in which they've been awarded – be sure to play them! How do I enter the Superdrives competition? The Superdrives Competition is only open to Supercharged Club members. Visit the Superdrives page for all the details on the latest exclusive competition - you'll need to be logged in to enter! Only Supercharged Club members are able to refer a friend to BOTB. Up to 10 friends can be referred – simply visit the My Refer A Friend page to refer a friend and track the progress of all your referrals. Yes! 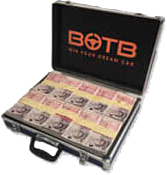 Tell your friends about BOTB and earn Dream Car Credit in the process - £10 if you are in the Bronze tier, £12.50 if you are Silver and £15 per referral if you are in the Gold Supercharged Club tier. All your friends have to do is spend £10 and you'll be credited with your Dream Car Credit. Please note, Dream Car Credit for referring friends will only be awarded if you are Supercharged at the time your friend has paid £10 or more to play. Track the progress of all your referrals on the My Refer A Friend page.